Thank God It’s Friday! It’s been a week full of ups and downs. That is, down, down, down then up, up, up, up. Now I’m still on the high. Sometimes all you need to do is just smile, also just because it’s Friday. Smiling has a thing linked to inner happiness *ask Kawi*. My parents, just seeing them and talking to them can bring me from *down here* to *up there*, they console me, they give me psyche, they are clowns by the way, too funny. And when they say listen to your parents, listen to them, chances are that they’ve been where you are. Think positive, I always try to do that. Think happy thoughts, they make you feel better in most ‘not so interesting’ situations. Life has an interesting twist…things just happens, negative and positive things. It’s you who chooses what you will call those happening’s and how you will look at them, they could be blessings, miracles, luck, bad luck, jinxes, heart breaks e.t.c. I choose to call them blessing tweaked with some luck. How you look at it affects your moods, your feelings, your views and so on. Had to add this one, the illegal one. Love in general rocks, if you don’t have love, please look for it. I love love. My cousin is graduating today and with a first class honors *whoop whoop*. He’s definitely following good footsteps 🙂 and I’m beyond happy. So there’s a lil’ something for him today. I’m thinking movies at the cinema, assignments, and my baby sister is home for mid-term…yaaay! That girl makes me happy. There’s Dj Cleo … for those going, enjoy on my behalf just in case I don’t go, fat chance is that I won’t. Some time out. A road trip … a fancy place just out town would really do me some good. 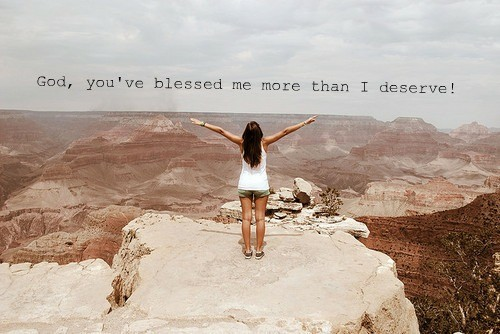 I want to thank God for the little and the big blessings in my life, those that I see and those that I haven’t yet seen. I know, cliché prayer but I actually do mean it.